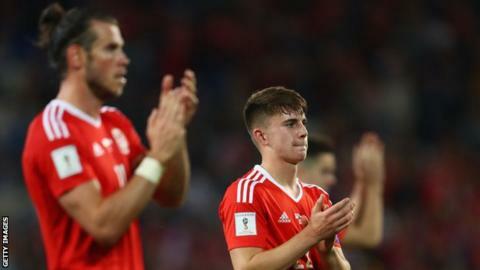 Wales can turn to Ben Woodburn to fill the role left by Gareth Bale's injury, according to Dave Edwards. Real Madrid forward Bale has been ruled out of Wales' final two World Cup qualifiers against Georgia and the Republic of Ireland with a calf strain. Woodburn came off the bench to help Wales beat Austria and Moldova. "I've seen a lot of Ben in this campaign and he reminds me of what Gareth Bale was like when he was younger," Edwards told BBC Sport Wales. "And if you see what Gareth was like in the Euros, the bigger the stage, the more he thrives." Elis James' Feast of Football: How do you solve a problem like an injured Gareth Bale? Bale could be out for a month and that would also rule the 28-year-old out of the play-offs in early November, should Wales reach them. His absence could mean a first international start for Woodburn, whose goal off the bench against Austria in September catapulted him onto the big stage. The 17-year-old Liverpool forward followed that up, again as a replacement, by producing the cross for Hal Robson-Kanu to score the opening goal against Moldova in the 2-0 win. "There aren't many players who can do that when the whole world is watching," Edwards said. "From what I've seen, I'm pretty sure Ben Woodburn is cut from the same cloth and he will relish the chance to show everyone he is the real deal." Wales have not won any competitive game without Bale since 2013 and have not won an away qualification match without him since a 1-0 win over Azerbaijan in June 2009. Edwards, a 10-year veteran in a Wales shirt, scored the winner in that game and says the quality in the squad is much better now. "Yeah it is a million miles apart, it really is. When I first started you could not replace a Craig Bellamy or a Simon Davies, it was too hard to fill their boots," he said. "But now I look around at the quality and the number of Premier League players, and not just Premier League players but top Premier League players. "They proved in the Euros they can do it on the big stage. It is the best shape Welsh football has ever been in and that has got to go down to the strategy implemented 10-15 years ago. "Welsh football is a lot stronger than when I made my debut." Bale faces being ruled out for up to four weeks which makes him a doubt for potential World Cup playoffs next month. The forward discovered the severity of the injury after having a scan after joining up with Wales. Despite the strength in depth in Chris Coleman's current squad, Tom Lawrence admits it is difficult to replace someone of Bale's calibre - but says that Wales can still qualify for the World Cup in Russia without him. "It is our worst nightmare to be without him, but we can't do anything about it," said the 23-year-old Derby County player. "Everyone knows how good he is, he plays for Real Madrid. It is something we've got to deal with, the players coming in need to put a shift in for the team. "Whoever comes in needs to step up and do a job without him... we've got a strong squad and whoever comes in will be a strong member. "He's a big loss, but that doesn't faze us, we've been without him before and will deal with it again. "I wouldn't say I can replace him, I'm a different kind of player to Gareth Bale, but whoever comes in will need to put in as much effort as they can." Wales, second in Group D and trailing leaders Serbia by four points, face Georgia in Tbilisi on Friday and the Republic of Ireland in Cardiff three days later. Second place could be enough to earn Coleman's team a place in the play-offs, which will see eight of the nine runners-up in the European qualifying groups play for four remaining places in Russia 2018. In order to secure a play-off place, Wales would realistically need at least four points from the final two group games.